The Servers tab provides a complete list of all servers that exist in your environment that you added either manually or during installation. You also have the option of adding new servers to the environment and editing certain settings of existing servers. Note: Analytics servers register automatically when you upgrade to Relativity 7.5 or above. You can also manually add Analytics and worker manager servers through the Servers tab. The Servers item list displays information like the server name, type, and version. You’re a system admin, and one of your firm's clients, handed over a large group of documents. One of the things you want to accomplish with Relativity’s Analytics features is set up a Structured Analytics set to display email threads in an easy-to-read manner for reviewers and system admins who need to look at any of the thousands of emails. Due to the fact that you're already using a large amount of resources for Analytics indexes in the environment, your infrastructure manager encourages you to create a new server specifically to handle the job of facilitating your Structured Analytics set. To do this, you navigate to the Servers tab and click New Resource Server. You give this new server a name related to the case matter and Structured Analytics set you’re creating. For the Type field, you select Analytics Server. For the Analytics operations field, you deselect the Analytics Indexing choice because there is already at least one server in your environment used for indexing, and you’re only going to use this new server to facilitate Structured Data Analytics functions. You provide a valid URL. You also provide all pertinent REST API information, which needs to match the information you entered when you installed the Analytics sever. You then leave the other values at their defaults and save the new server entry. You can now select the new server when creating your Structured Analytics set. Among the fields in the servers view available for filtering is the Type field, which lists all server types associated with your environment. To see a list of these types, filter on the Type field by clicking the filter icon and then clicking Select on the Type field. The agent server facilitates the work of various agents in Relativity. There must be at least one active agent server per environment. For more information, see Installing to agent servers. Cache location servers temporarily store natives, images, productions, and other file types the viewer uses. During installation, Relativity automatically creates one cache location server per file repository that is currently in use. It appends a subfolder called cache to the file repository path, such as \\localhost. In addition, you can add cache location servers to resource pools, so that they are available to select when you create a workspace. You must select a default cache location server when you create a workspace. For more information, see Resource pools and Workspaces. The Services server accommodates the Relativity.Services application pool, which is added automatically with the Relativity.Services virtual directory during installation. The distributed server accommodates a distributed instance of a SQL Server, which can house multiple workspace databases at one time, with the primary SQL instance housing the EDDS database. For more information, see Using the Relativity installer. The primary server accommodates the primary instance of SQL, which houses the EDDS database. For more information, see Using the Relativity installer. When you run the installer for the primary SQL Server, it adds the following applications to your SQL Server: Relativity, Relativity Primary Database, and Relativity Primary Procuro. These applications are required for optimum performance of Relativity. To avoid issues with registry settings, and the need for additional reset steps, don’t uninstall these applications. On an SQL Server profile, you can edit the Workspace Upgrade Limit field, which controls the number of agents accessing the server during an upgrade. The setting entered in this field can’t exceed the setting in the GlobalWorkspaceUpgradeLimit instance setting value. If you enter a number that exceeds this instance setting value, an error occurs that cancels your update. For more information, see Instance settings' descriptions and Upgrading workspaces. Web - Distributed: Forms Authentication - facilitates authentication based on specific code for distributed web servers. This is added automatically during Relativity installation. Web Background Processing - facilitates web background processing windows service, which is added automatically with the corresponding application pool during Relativity installation. WebAPI: AD Authentication - facilitates active directory service for the WebAPI component. This is added automatically during Relativity installation. For more information, see Authentication. 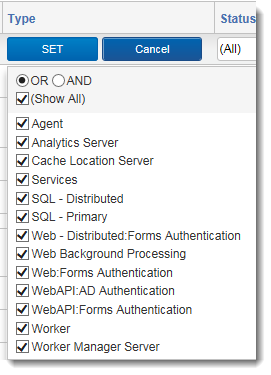 WebAPI: Forms Authentication - facilitates authentication based on specific code for the WebAPI component. This is added automatically during Relativity installation. The Analytics server facilitates Relativity Analytics functions. This server, if active, is available for selection when you're creating or editing an Analytics index, Structured Analytics set, and Relativity Assisted Review project. For more information, see Adding an Analytics server. The worker manager server performs processing, imaging, and conversion. This server also facilitates all phases of a processing job, including inventory, discovery, and publish. See Configuring the worker manager server for more information. You can restart Windows Services for agent servers, web background processing servers, worker manager servers or analytics servers by using the Windows Service console. Navigate to the Servers tab. Click the server with the Windows Service you want to restart. Running - appears if Relativity detects the Windows Service is running. Stopped - appears if Relativity detects the Windows Service is stopped. Pending - appears if Relativity detects the Windows Service is in the process of restarting. Unknown - appears if Relativity is unable to detect the status of the Windows Service. 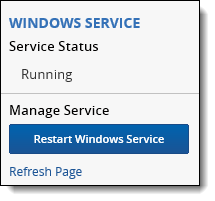 The Manage Service section of the Windows Service console allows you to restart the Windows Service or refresh the page. Click Restart Windows Service to restart the service. Click Refresh Page to revise the Service Status. Note: You can also restart multiple Windows Services by using the mass operation option at the bottom of the Servers tab.